As the global economy struggles with a “low growth trap”, Chinese Premier Li Keqiang has said the current scenario is an opportunity for BRICS allies China and India. “This era is presenting China and India a great opportunity. At a time when the world economic recovery remains sluggish, the dynamism of Asia is needed more than ever. With a combined population of 2.5 billion that accounts for 1/3 of the world total, China and India represent an enormous market. If China and India work together and forge synergy, it will deliver benefits not only to the Chinese and Indian people, but also to Asia and beyond,” Li told a gathering of senior Asian editors in Beijing this week. “The world economy will meander along at its slowest pace since the financial crisis for a second year in a row in 2016 as it is ensnared in a “low-growth trap”, the rich-nations bloc, the OECD warned on Wednesday. The Eurozone GDP grew 0.5 per cent in the first quarter, but is expected to expand just 0.3 per cent this quarter, according to a May Reuters poll. In contrast, India’s GDP grew 7.9 per cent year-on-year in the March quarter, official data showed this week. China, the world’s second largest economy, grew 6.7 per cent in the March quarter. Chinese Premier Li on Tuesday stressed that China and India should stay focused on enhancing political trust. Earlier in April, China praised India’s decision to refuse to patrol the South China Sea with the US. Premier Li Keqiang also said on Tuesday that the Sino-Indian border dispute must be settled “step by step”. “Such a complex issue that has existed for a long time couldn’t be resolved in a short span of time. That would be too much to ask. This will take time, just as when one has his meal, he should eat one mouthful at a time,” Li told the representative of the Indian daily The Statesman. The Indian administration led by Narendra Modi has aimed at cooling down a standoff on the ill-defined and disputed border with China. 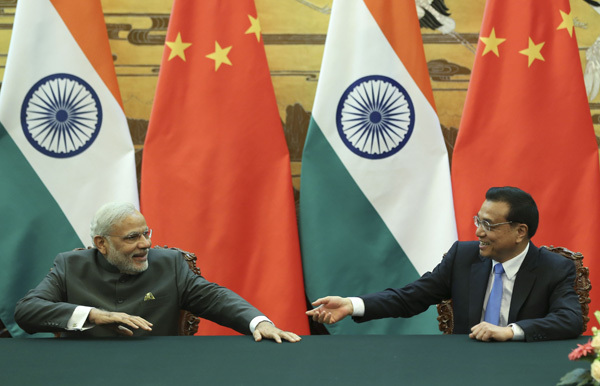 Last year, Modi, in an interview to a US magazine, said India and China do not need third parties to meddle in their affairs. “I firmly believe that the relationship between two countries, the India-China relationship as you are referring to, should be such that to communicate with each other there should really not be a need for us to go through a third entity. That is the level of relationship that we currently have,” Modi said in an interview to Time magazine. Referring to India’s recent announcement of a trade corridor deal with Iran and Afghanistan, Li said Beijing “welcomes” it. “It is good news to China to see a new growth point in any country, as it may bring more opportunities to Chinese companies too. Competition is only natural in a market economy and we welcome it,” he added. Referring to disputes in the South China Sea, China’s Premier Li Keqiang said these “differences” with some neighbours are “not the mainstay of China’s relations with those countries”. “Our common interests far outweigh those differences. One should bear in mind that the Chinese believe in “not doing to others what one does not like oneself.” The Chinese people suffered aggression and oppression in modern times, and we do not want to see similar things happen to other countries,” Li said on Tuesday in the interaction with editors from different news networks of Asia. China claims most of the South China Sea, through which $5 trillion in ship-borne trade passes every year. The Philippines, Vietnam, Malaysia, Taiwan and Brunei have overlapping claims, as well as close military ties with Washington. China has been angered by what it views as provocative US military patrols close to islands China controls in the South China Sea. The United States says the patrols are to protect freedom of navigation. The BRICS Post encourages its readers to engage in meaningful commentary, discussion, exchange and feedback keeping in mind respect for other opinions. While we welcome criticism of our website, its articles and opeds, The BRICS Post moderates all incoming messages to ensure that there is no profanity, attack on individuals, attack on race, religion, or creed; we also will not allow room for threats or impersonation of other individuals. Our comments section is designed to be a forum for the healthy, democratic exchange of ideas. We reserve the right to edit a comment for obscenities and vulgarities. There is no guarantee that every comment will be published unless it meets with the criteria above.